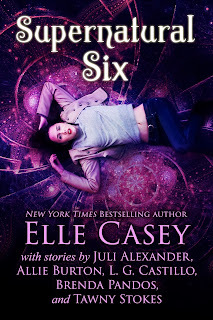 Comfortably Read: Supernatural Six Promo, Excerpt, and GIVEAWAY!!! Supernatural Six Promo, Excerpt, and GIVEAWAY!!! Secret powers, genies, mermaids, angels, vampires and demons. There’s something for every paranormal enthusiast. 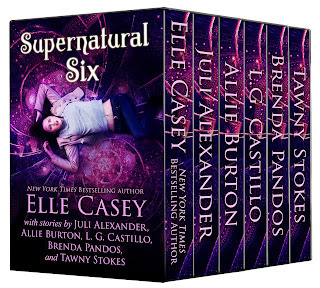 Supernatural Six brings you six novels from six authors who know how to raise the stakes and tame the darkness. What's included in Supernatural Six??? Take a look!! 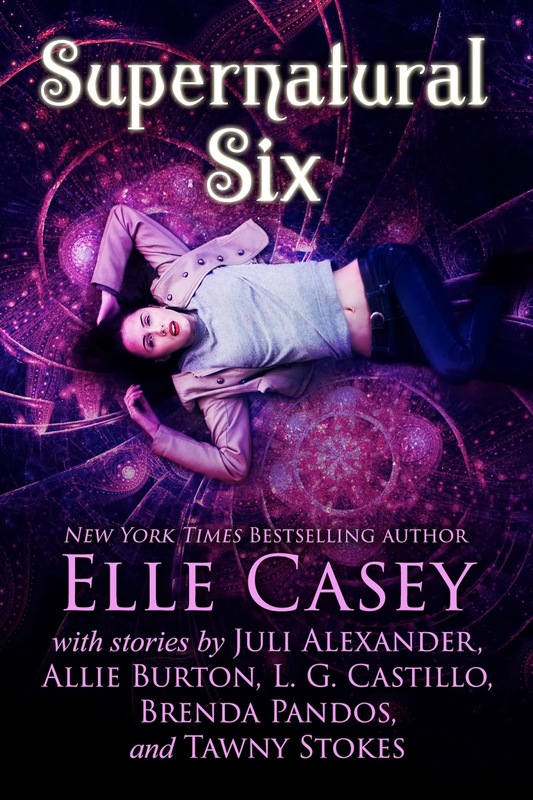 Duality by Elle Casey (New York Times Bestselling Author) – Malcolm’s had a problem for as long as he can remember. No matter where he goes or what he does, he leaves misery in his wake. But then Rae shows up in his life, and everything changes. Darkness cleaves to light. Anger yields to joy. The question is whether she’ll be his salvation or his destruction. Three Wishes by Juli Alexander – Not every seventeen-year-old girl works part time granting wishes, but when you’re a genie, you have obligations. Jen finally gets a shot as a drummer in her brother’s band. Just when it’s looking good for her, Leo Fuller shows up, and this bad boy genie’ s after more than just her drummer gig. Atlantis Riptide by Allie Burton – Teen runaway Pearl craves anonymity, but when she saves a toddler from drowning she draws attention to her special water skills. Unknown to her, a war rages under the ocean and each side wants to use her powers for their cause. Pearl must choose her own destiny—ignore the churning seas or swim into battle. Lash by L.G. Castillo – Banished angel Lash seeks to redeem himself by protecting Naomi, a woman who has lost her faith. But when danger threatens — and his passion for her swells — will he choose his cherished home or his heart? The Emerald Talisman by Brenda Pandos – Julia Parker would trade her ability to feel others emotions in a heartbeat, especially half the boys in school. When a vampire hunter rescues her before she’s devoured by a bloodthirsty stalker, Julia discovers no one is safe. Unsure how to help, she seeks the advice of a psychic, only to find out she alone is the key to stopping the madness, problem is it’ll require her rescuer’s life. Static by Tawny Stokes – Salem, a teenage groupie for the punk band Malice, gets more than she bargained for after a night of partying with the band–a headache, a stomachache and a sickness that’s turning her into something inhuman. Only Trevor, the roadie, can help her navigate her new world of danger, darkness, and love. Here's an excerpt from The Emerald Talisman by Brenda Pandos!!! Darkness enveloped me as I forged deeper into the woods. I tried to keep my thoughts light and happy as my heart pumped a little faster. The setting could have been a scene right out of a horror movie, a genre which I faithfully avoided. I knew one day I’d be in a similar harmless scenario that would only terrify me by fueling my over-active imagination. On the other hand, walking with someone, like a cute boy, would make this whole scary ordeal into a romantic dream. I shifted my focus to imagine myself walking hand in hand with him. Maybe he’d stop, look into my eyes and I’d get my first kiss. The rustle of a fern next to me broke my happy thoughts. I froze, stopping in the middle of the trail. With wide eyes, I searched for the source. I held my breath, straining to listen for what seemed like an eternity, as the noise of pounding blood filled my ears. I was ready to run if something jumped out at me. Nothing happened, so I took a little step sideways. Still nothing, so I tried another step. Something launched itself out of the bush towards me. I shrieked and shielded my eyes as it flew by my face. My legs folded underneath me and I balled my arms around my head. The last thing I wanted was a bat or some flying insect to nest in my hair. The air couldn’t come into my lungs fast enough as I tried calming myself down, suspecting every second I remained in this panicked state, precious years were coming off the end of my life. I listened and heard nothing further. Mentally, I encouraged my legs to straighten, but they were still frozen and starting to shake. My effort to soothe myself wasn't working. I took a few more deep breaths. You’re just being paranoid. You’re alone and you know it. Nothing in this forest can harm you. Just get home. My thoughts comforted me; my heartbeats subsided to a normal rhythm in response. I opened my eyes to focus on my surroundings. The cricket’s soft chirping encouraged me to stand up and keep going. The walk home was really no big deal. I knew this path by heart. Ahead was the suspended foot bridge that spanned the creek and I’d be home. Courage replaced fear as I stood up, dusted myself off and spotted the bridge’s lantern through the trees gently swaying in the breeze. It softly beckoned to me, welcoming me in the darkness. Over time, the creek’s erosion created a large ravine that wrapped around the great redwoods of the forest. The cliff sides were covered with ferns, ivy and moss, making perfect homes for little birds and other animals—the same animals that were scaring the living daylights out of me. “If you don’t bother me, I won’t bother you,” I whispered. I gently stepped onto the time-weathered bridge, causing it to shudder and creak. The last thing I needed was my presence alerted. I tried my hardest to keep my shoes quiet as I walked across, but it still moaned in protest. Between the wood slats, I could see the moon brightly reflecting off the water’s edge, rippling brilliantly in the current. The gentle flow of the stream echoed in the caverns, softening the noises I made. But when the wind picked up and ruffled the ferns, it swayed the massive bridge. My heart began to beat faster as the bridge loudly groaned under the wind’s strain. Fear took over as I bolted the rest of the way across, panting for air on the other side. An animal, startled by my sudden wild movements, scurried into the brush. I jumped. It’s just another animal, Julia—don’t freak out! And here's what you've been waiting for: THE GIVEAWAY!!! --A choice of a $50 GC to Amazon, B&N or iTunes. K.A. Young - Double Release!! !